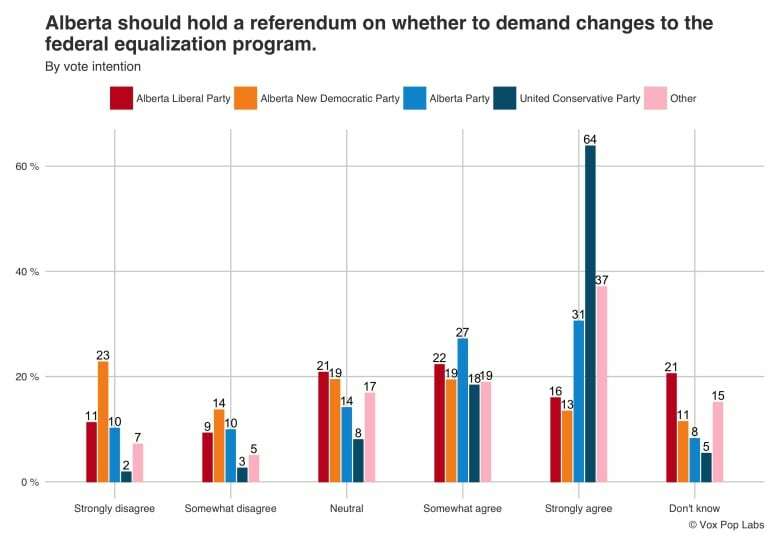 Most Albertans want the province to hold a referendum on whether to demand changes to the federal equalization program, according to an online survey. Fifty-seven per cent either somewhat agreed or strongly agreed that a referendum should be held, according to data provided by Vote Compass, a tool designed by Vox Pop Labs for CBC News. Just nine per cent said they didn't know, 14 per cent remained neutral, and 20 per cent either somewhat or strongly disagreed. Education levels produced the largest split on whether or not a referendum should be held. 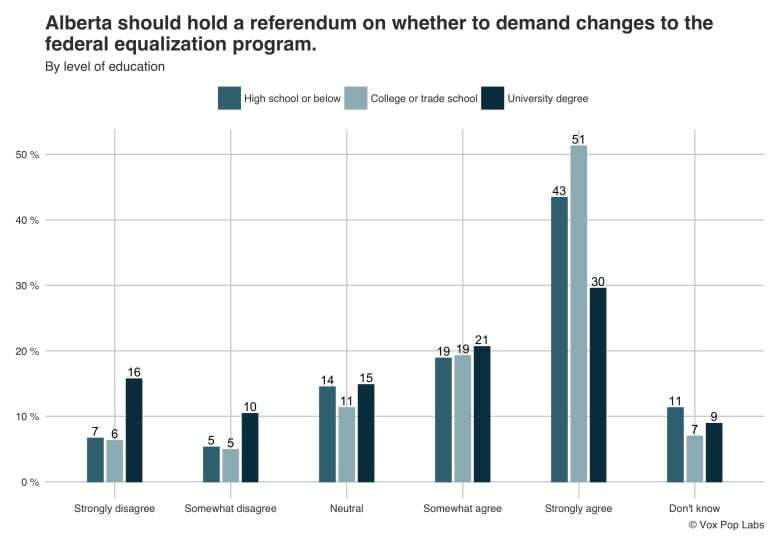 Sixty-two per cent of people with high-school education or below said the province should hold a referendum, and 70 per cent of those with college or trade school education agreed. But while still a majority, the number of university-education respondents who agreed dropped significantly, to just 51 per cent. Sixty-two per cent of men said they agree with holding a referendum, as did 51 per cent of women. The program is intended to address fiscal disparities between provinces, and was entrenched in Canada's Constitution in 1982. "Parliament and the government of Canada are committed to the principle of making equalization payments to ensure that provincial governments have sufficient revenues to provide reasonably comparable levels of public services at reasonably comparable levels of taxation," the Constitution reads. It's a myth that Alberta sends money directly to Ottawa for the program. All Canadians pay income tax to the federal government, and then that money is paid out to provinces based on each region's ability to raise revenues compared with the average. The formula that calculates how much each province gets has been controversial due to how it accounts for natural resource revenues. For decades, Alberta has received no federal support through equalization payments, while Quebec, for example, is set to receive $13.1 billion in 2019-20. The payments are unconditional — meaning each province can spend the money it receives as it wishes. A survey of 1,200 Albertans undertaken by pollster Janet Brown for CBC last spring found 70 per cent think the current equalization payment system is unfair. Half strongly felt it was unfair while, while 20 per cent "somewhat" agreed. UCP Leader Jason Kenney said he plans to hold a referendum on equalization as a way to hold Ottawa's feet to the fire over getting a coastal pipeline built. Vote Compass found a whopping 82 per cent of UCP supporters agreed with that policy. The NDP said in a press release in March that Kenney mischaracterizes how equalization works, and pointed out that Kenney was part of the Conservative government that brought in the current equalization formula in the 2007 budget. Only 32 per cent of NDP supporters said they wanted a referendum. The party said it supports looking at the formula but believes a referendum would be a dead-end, and also suggested that one of the UCP's equalization proposals could make the Canada Health Act unenforceable in the province. 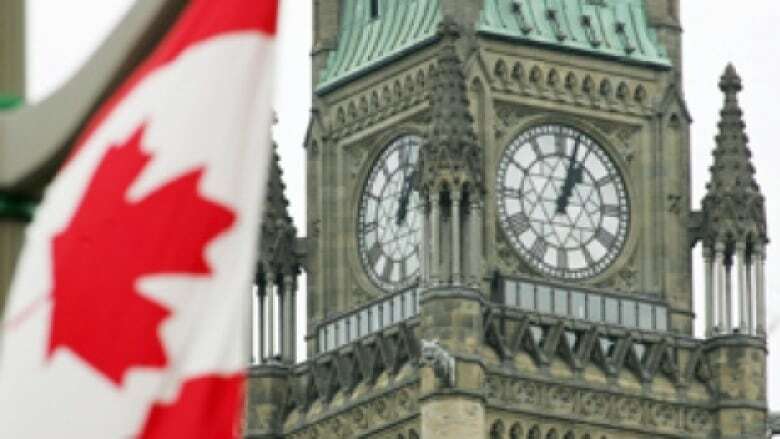 In June 2018, the federal government announced it would extend the current payment formula until 2024 without negotiating with the provinces, several politicians said. At the time, Alberta's finance minister stated the province's opposition to the decision. The Liberal platform states that while the equalization formula isn't fair, a "referendum" would not give the province power to amend the Constitution. Instead, the party says it will demand the formula be changed to treat provinces' hydro revenue the same as Alberta oil and gas, and that if those demands aren't met, a Crown corporation will be established to remove energy royalties from equalization formula calculations. Alberta Party Leader Stephen Mandel has also said he plans to push for changes to what he called an "unfair equalization program." And the Freedom Conservative Party plans to demand an end to equalization and replace all federal transfers with "tax points." Thirty-eight per cent of Liberal supporters agreed with the idea of holding a referendum, as did 58 per cent of Alberta Party supporters. FCP supporters were not included in the Vote Compass data. Developed by a team of social and statistical scientists from Vox Pop Labs, Vote Compass is a civic engagement application offered in Alberta exclusively by CBC/Radio-Canada. The findings are based on 117,209 respondents who participated in Vote Compass from March 20, 2019, to April 9, 2019. Unlike online opinion polls, respondents to Vote Compass are not pre-selected. Similar to opinion polls, however, the data are a non-random sample from the population and have been weighted in order to approximate a representative sample. Vote Compass data have been weighted by gender, age, education, language and region to ensure the sample's composition reflects that of the actual population of Alberta according to census data and other population estimates.